This is the second time I made a cake with a swirl, and this time I am as happy with the result as I was the first time! This cake ist just great - the moisty cake, the orange-nut-chocolate-combination for the swirl ... just wonderful. And look how pretty the swirl is! I exchanged the chocolate chips for a chocolate spread (because I have to get rid of it...) that is infused with blood orange flavour, thus supporting the slight orange flavour in the batter. It's made easily, looks pretty and is overwhelming in taste - what more can you ask for? Thanks so much to Jennifer of Cooking for Comfort who opted for the great Nutty Chocolatey Swirly Sour Cream Bundt Cake! Go to her page to find the recipe, or have a look at Dorie's book (page 182). WOW! Your cake looks spectacular! Thank you for baking a long with me! Love your bundt mould - it is fabulous. Chocolate spread sounds like a fab sub-in. This cake is a keeper..nice job.love the filing!!! Your version looks and sounds fabulous! nice changes! choc spread would be excellent in this i bet! 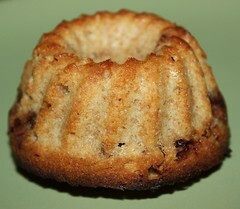 Love your mini bundt! :) That chocolate spread sounds amazing, too! love those minis! So cute!! I loved this cake too! That swirl was amazing. Yours looks great. Lovely cake...and I can only imagine that this blood-orange chocolate spread is one of those fabulous things only found in Europe. Sounds like a great addition to the cake! Cute little bundts! That spread sounds really good and perfect for this recipe.